The Florida LAKEWATCH Program is one that trains citizen scientists to monitor water quality at locations throughout the state. Created in 1986 as a partnership between the University of Florida’s Institute of Food and Agricultural Sciences (IFAS) and School of Forestry Resources and Conservation, LAKEWATCH has trained thousands of volunteers to monitor hundreds of bodies around the state for many years. In 1991, the state recognized the value of this program and, through a state statute, provides an annual budget to continue. In Escambia County, the LAKEWATCH program has been monitoring local waterways since 1998. Volunteers are trained and overseen by the Sea Grant Agent at the County Extension Office. There are currently four estuarine bodies of water being monitored, but there has been one creek and four lakes monitored in the past. The parameters selected to monitor are trying to determine the waters trophic state. Trophic refers to “feeding” and biological productivity. An excess of nutrients can cause low dissolved oxygen and fish kills. This has historically been a problem in Escambia County, particularly in the bayous. Oligotrophic – indicates the waterbody is nutrient poor. Mesotrophic – indicates the waterbody is mid-range for nutrients. Eutrophic – indicates the waterbody is high in nutrients. Hypereutrophic – indicates the waterbody is excessively high in nutrients. It is important to understand that (a) some bodies of water are naturally oligotrophic or eutrophic, and (b) secchi readings are subjective. Below is the 2018 update on water quality from each. Only Carpenters Creek has been monitored by LAKEWATCH, and has not been monitored in four years. However, there are 14 years of data prior and the creek seems to be low in nutrients. That said, the water clarity is not as good and there could be sediment discharge issues that the community could address. 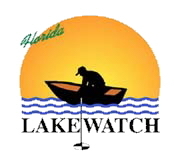 LAKEWATCH has monitored five lakes in Escambia County over the years. Two of those, Blue Angel and Crescent Lake, were both low in nutrients but had not been monitored by LAKEWATCH for 14 years. Crown Point Lake seems to be doing well but has not been monitored in five years. Though they have not been monitored in four years, Grand Lagoon and Stone Lake were high in nutrients. The residents of those communities may want to consider monitoring again and, if nothing has changed, change behaviors to help improve them. Bayou Texar has been monitored by LAKEWATCH for almost 20 years. It has gone from hypereutrophic to eutrophic over that time. Lower Perdido Bay is low in nutrients and mid-range in chlorophyll a. 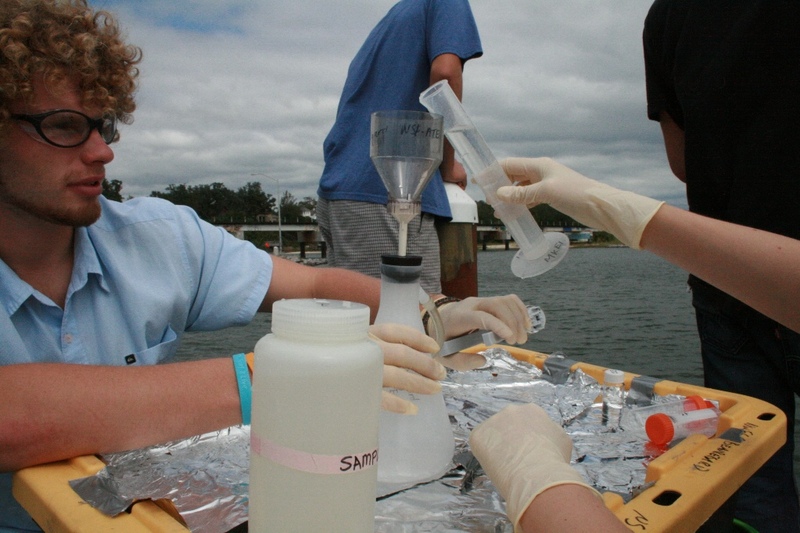 Citizen scientists monitoring water quality on Bayou Texar. Two stations were monitored along Carpenters Creek between 2000 and 2014. Those two stations were located north of where Airport Blvd crosses the creek, and east of where Davis Highway crosses. Phosphorus and nitrogen are nutrients that can fuel the growth of algae. Excessive algae (an algal bloom) can reduce water clarity (impeding photosynthesis for bottom dwelling plants – like seagrasses) and increase biological oxygen demand – which can lead to fish kills. The mean values for these nutrients suggest that Carpenters Creek (between 2000 and 2014) was mesotrophic. Chlorophyll a directly measures the amount of algae in the water. These mean values indicate that the creek is mesotrophic as well. The Secchi readings indicate the water in the creek is very turbid (not clear). The reduced clarity is probably associated with sediment runoff from surrounding development. Though the other data do not suggest an eutrophication problem with this runoff, sediment runoff can still smother needed submerged plant communities – impacting fisheries in both the creek and adjoining Bayou Texar. Blue Angel Lake is located near the west entrance to NAS Pensacola. It was only monitored from 2003 to 2004. These data suggest that in 2003 and 2004, Blue Angel Lake did not have a nutrient issue. Crescent Lake is located north of Michigan Avenue between Mobile Highway and Brent Lane. It was monitored for only one year – 1998. These data suggest that Crescent Lake was only sampled once during 1998. There did not seem to be a nutrient issue but water clarity had a value suggesting it may have sediment runoff issues. Crown Point Lake is located north of Highway 98 on Perdido Bay. It was only monitored between 2012 and 2013. Like the other lakes that have been sampled – the nutrient levels are not high but water clarity is low. This, again, suggest sediment runoff. Grand Lagoon is located south of Gulf Beach Highway between Bauer Road and Blue Angel Parkway. It was monitored for four years between 2002 and 2014. During the four years Grand Lagoon was monitored the data suggests excessive nutrients in the water. These excessive nutrients can come from (a) lawn fertilizers and grass clippings, (b) animal waste, and (c) septic tanks. It was almost five years ago when monitoring of this location stopped. Residents of this community might consider monitoring once again. Stone Lake is located south of Highway 4 between Clary Road and Highway 29 in Century. It was monitored for 10 years between 2002 and 2011. This 10-year data set suggests 10 years ago, Lake Stone was high in nutrients and the problem was increasing up until the time they stopped monitoring. This is another location where a local community member might consider monitoring. Bayou Texar is located in east Pensacola near where Scenic Highway / Cervantes Street merge. It was monitored for three years between 2000 and 2002 and then again for 11 years between 2007 to the present. It is our most monitored body of water. With our larger estuaries, volunteers monitor three stations accessing them by boat. Between 2000 and 2002, the waters of Bayou Texar near the Cervantes Bridge were high in nutrients. This body of water has had a history of fish kills dating back to the 1960s and 1970s. Though fish kills are not as common now, the nutrient issue is still there. Excessive nutrients can come from (a) lawn fertilizer, leaves, and grass clippings, (b) animal waste, and (c) septic tanks. Bayou Texar, being a larger estuary, is collecting spot for runoff from across the entire watershed. It will take the entire behavior changes across the entire watershed to improve things. Since 2007, Bayou Texar has been EUTROPHIC – high in nutrients. However, phosphorus has been mid-range and declining. Our part of the Florida does not typically have issues with phosphorus as central and south Florida do. Nitrogen has been slightly increasing over time. Steps should be considered to try to slow this. There are practices such as Florida Friendly Landscaping, Living shorelines, Clean boater, and removing pet waste. Keep in mind, Texar is a catch basin for the entire watershed and the improvements will have to come from within the entire watershed – which would include septic tanks. Bayou Chico is located just west of downtown Pensacola. LAKEWATCH has monitored Bayou Chico from four years (2014 – present). Presently we do not have a LAKEWATCH volunteer monitoring Bayou Chico – if interested, contact me. Chlorophyll levels in Bayou Chico are hypereutrophic and high enough to trigger fish kills – though reports of fish kills are low (2018 Fish Kill Report will be posted in November). What is interesting is the phosphorus levels are higher in Bayou Chico than the nitrogen levels. One explanation for this is that the excessive nitrogen has been taken up by the algae – generating the high levels of chlorophyll found. However, they should be removing phosphorus as well. Another note here is this body of water is less saline that Bayou Texar. Bayou Grande is the largest of the bayous (hence the name) extending 5.3 miles. Gulf Beach Highway runs along its north shore and NAS Pensacola along its south. It has been monitored for six years (2012 – present). Though there has been a slight increase in nitrogen, since 2012 the nutrient levels in Bayou Grande have been very low. The chlorophyll levels are high, but have been decreasing over time. The clarity of the water has been poor but has been improving. Historically, Bayou Grande has some of the largest fish kills in the region. Large fish kills have not been reported in years and the nutrient problem seems to be improving. Extending about 17 miles from the river to the Gulf, Perdido Bay serves as the state line between Florida and Alabama. It has had a history of water quality problems, but a lot of these are from industrial discharges releasing metals and other contaminants in the upper portion of the bay. Some residents of lower Perdido Bay (south of highway 98 bridge) have indicated fewer seagrasses, oysters, and crabs – while others have said they have seen an increase. Historic documents suggest that Perdido Bay was probably less saline than it is now. Though fish kill records here have not been as high as those of the bayous do, there is still local concern about the health of this body of water. Lower Perdido Bay has been monitored by LAKEWATCH for four years (2014 to present). Since 2014, the nutrient levels in lower Perdido Bay have been low. The chlorophyll and secchi readings suggest more nutrients in the system but again, this could be due to nutrient uptake by the algae. Again, this area has not been known for the large fish kills seen in the bayous decades ago, and the nutrient levels now are good. It is interesting to see the low salinity readings from this body of water. Usually the lower portions of large estuaries have higher salinities than we are seeing here. However, the mouth of Perdido Bay is very narrow and about four miles from where these samples are being collected. This bay appears to be less saline than others along the panhandle are. Florida LAKEWATCH Water Quality Monitoring Program. http://lakewatch.ifas.ufl.edu/index.shtml. Florida LAKEWATCH. Trophic State: A Waterbody’s Ability to Support Plants, Fish, and Wildlife. http://lakewatch.ifas.ufl.edu/pubs/circulars/trophic2.pdf.